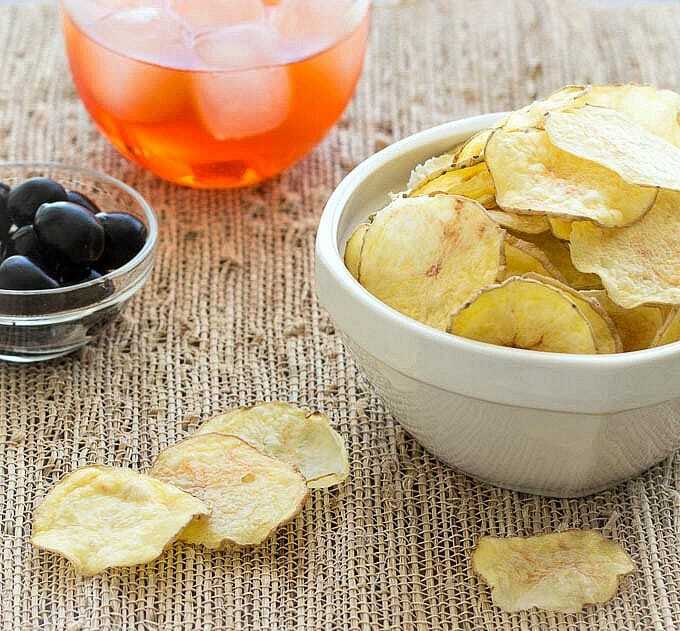 Homemade potato chips that you can easily make at home in the microwave! It’s a crime to have a sandwich without chips, it’s a match made in heaven! But potato chips aren’t always the healthiest thing to have on your shopping list. These homemade potato chips are made in the microwave without a drop of fat and they are so crispy you’d never know they weren’t “the real thing”. All you have to do is thinly slice the potatoes (skin off or on, it’s up to you), and microwave them for a couple of minutes on each side. 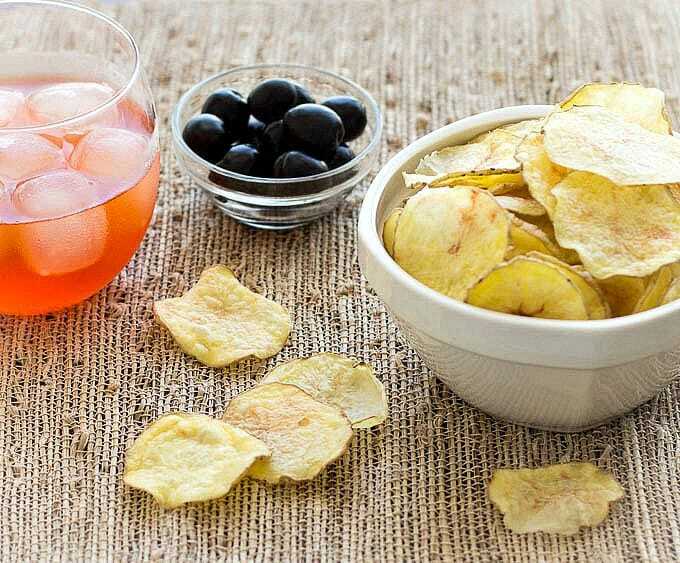 Flavor them however you want and enjoy your homemade potato chips! I went simple and just seasoned with salt but you could play with all kinds of flavors here, the possibilities are endless: salt and vinegar, paprika, cayenne pepper, chili powder, etc. 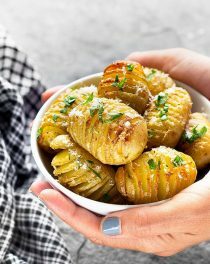 When you put the potato slices on the plate, make sure they don’t overlap or they’ll get stuck to each other! 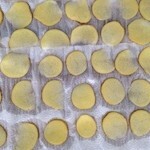 Potato chips will stay crispy for a few days kept in an airtight container or zip-lock bag. 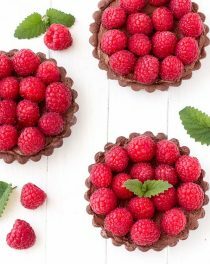 If you’re counting calories, or just looking to rustle up a quick snack, I dare you not to love this quick, easy and healthy snack! 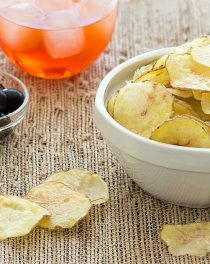 Try these homemade potato chips, and let me know what you think! Leave a comment and don’t forget to take a picture and share it on my Facebook page or tag it #aseasyasapplepie on Instagram! 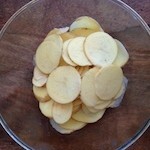 Make healthy and delicious homemade potato chips in the microwave- no oil or deep frying needed. 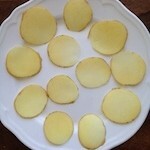 Wash the potatoes and slice them as thin as possible with a knife or a mandoline. Put the slices in cold water and rinse a few times, until the water is clear. This will help remove the starch. Dry the slices with paper towels. and arrange them on a dinner plate. Make sure they don't overlap or they will stuck to each other. 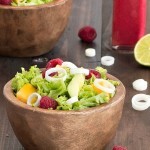 Lightly sprinkle with salt or other spices. Microwave the potato slices on high for 3 minutes. Flip them over and microwave for another 2 minutes. Remove any chips that are starting to crisp and brown. Once golden, they are done. Transfer the cooked homemade potato chips to a bowl. They will get crispier once they are completely cool. I’m amazed at how crispy these got in the microwave! I would have never guessed it. My husband and I are on an oil-free diet and have been really missing potato chips….he loved these! Thanks for the great recipe. This is a very clever snack idea. I made this last night and it was fantastic. I just used garlic salt on the potatoes and they were better than bagged potato chips. I put a colander in a large bowl filled with water and sliced the potatoes into that. Then I took out the colander and all the starch was left in the bottom of the bowl. I put them in fresh water again and stirred them around. No starch came off them. My little microwave needed 6-7 minutes to fully cook the potatoes, but it really worked. Thanks so much for this recipe. I made them a couple of weeks ago just to try and they were a complete success. Husband keeps asking for them, and they are so quick and easy that … how can I say no?? 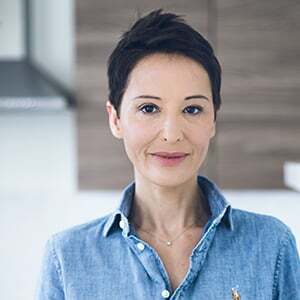 I am so glad to hear that, Marta! 🙂 Thank you for the feedback! This turned out great I’m just wondering if they’ll turn out the same in the oven? I want to make this more often as I’m trying to reduce fat consumption but my microwave is so small it takes ages to make a small batch (and they’re so yummy it takes about five seconds to eat them all). Thank you and any ideas for a bigger batch are welcome! Glad you liked this recipe, Tara! (Try with a small batch first).